Don’t let the Disney afternoon cartoon license fool you, Rescue Rangers isn’t just some easily-dismissed kiddie game. 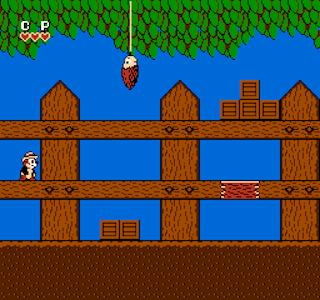 It’s a reasonably challenging (although not too hard) platform game based on a show that anyone who grew up with the NES probably also grew up watching. You can play as either Chip or Dale (and from what I can tell there is no difference between them), and the game predictably features all of the characters from the show, including Fat Cat as the primary villain. Rescue Rangers also allows for 2-player simultanous play, which was probably great back in the day for two kids, as no one had to wait their turn. The game reminds me a little bit of Clockwork Knight on the Saturn or any of the Micro Machines games in that you’re playing as a small character in a world built for larger people. For example, in the screenshot Chip is walking along a picket fence. I like it when games use this kind of technique as it appeals to the imagination, especially that of a younger child. Throughout the levels you can pickup flowers and stars; some out in the open and some hidden. 100 flowers or 20 stars each give you an extra life, which floats across the screen and must be caught. Most but not all of the levels culminate in a boss battle, and each is pretty similar – pick up a red ball and throw it at a boss who’s launching projectiles at you. If the ball hits you when it bounces back, you get stunned for a second or two. The game certainly isn’t going to turn the head of anyone who isn’t already a fan of platform games, but if you are and you’re tired of playing through the usual suspects (SMB, etc.) then this one is definitely worth checking out. I also like this game because I think that it appeals to both adults and kids. I certainly enjoyed playing it for this review but so would a child; especially one who is familiar with these characters. Buy Rescue Rangers on GameGavel or Amazon. Tagged Capcom, Chip N Dale, Disney, NES, Nintendo, Platformer, Review. Bookmark the permalink.